NEW YORK, Oct. 20, 2010 / — A spirit of rebelliousness has long pervaded New York’s Washington Square — which, after all, was named for the leader of the band of revolutionaries who founded this country. For the centennial of Washington’s inauguration in 1889, Stanford White (the great architect of the Age of Opulence) designed a wood-and-stucco arch in the style of Paris’s Arc de Triomphe, to reside at the north end of the square. It proved to be such a success that White was commissioned to render it in more permanent marble. The result is a stately and imposing structure that reflects power and might, even as it continues the rebel spirit of this landmarked public space. A similar defiance defines Bond No. 9 Washington Square — an iconoclastic, thoroughly modern rose-inflected eau de parfum that we hasten to debut on the occasion this month of the park’s reopening following a lengthy refurbishment. Washington Square, the eau de parfum, pairs the old-fashioned purple rose with tarragon, vetiver, and an unexpected leather accord. The result is an assertively dissident scent that never forgets to be beautiful; it has a female-male crossover appeal, whose balance is on the female side. In a first for Bond No. 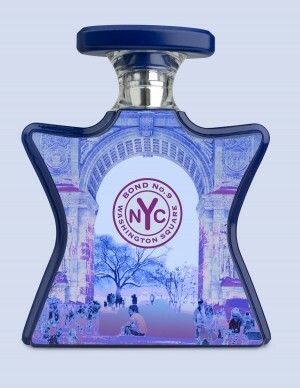 9, the bottle displays a contemporary vision of Washington Square, viewed through its arch past casually dressed park-goers in the foreground. So detailed is this photo-negative image that we even see the coffered square panels of the arch’s interior — each square with a carved rosette at its center. Rendered in filmy, faded blue, the surface design recalls the muted tones found in antique daguerreotypes. The bottle, like the square, is simultaneously old and new. Arriving on-counter in November 1, 2010, Bond No. 9 Washington Square will be sold at our four New York stores, Saks Fifth Avenue and bondno9.com. For International sales outside New York please visit bondno9.com.